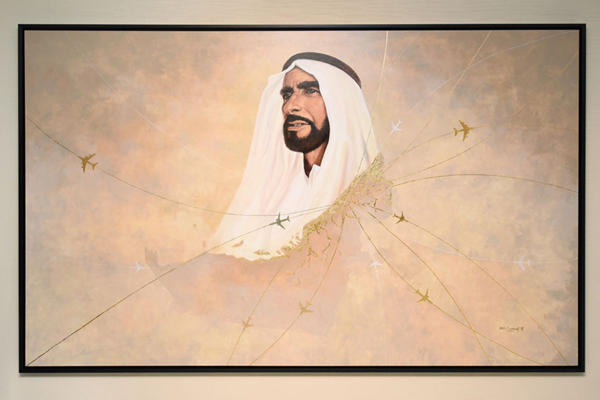 A specially commissioned art piece named ‘From the Heart of Zayed’ was unveiled by Sheikh Ahmed bin Saeed Al Maktoum, chairman and chief executive of Emirates Airline & Group on Thursday. The art piece, designed and created by Elygraf, a Filipino artist based in Dubai, was commissioned by Emirates Group to pay homage and celebrate the legacy of the late HH Sheikh Zayed bin Sultan Al Nahyan, the founding father of the UAE who continues to inspire present and future generations. The artwork will be on permanent display in the atrium at Emirates Group Headquarters and is part of a number of initiatives done this year to celebrate the ‘Year of Zayed’. ‘From the Heart of Zayed’ comprises three elements. The first element establishes the face of HH Sheikh Zayed, Father of the Nation, gazing firmly to the future. His golden bisht symbolises honour and nobility and follows the outline of the UAE map, which he led to unite. Dubai is highlighted by Emirates’ aircraft and extensive network that connects the world, all flowing out of his bisht, sending his messages of peace and prosperity. The art piece used a variety of techniques and materials to portray Sheikh Zayed. Elygraf used acrylic paint on stretched canvas and the art piece took him 20 days to complete. Its colour palette was inspired by a spectrum of the earthy tones found throughout the UAE, complemented by the use of gold leaf symbolising the regal embroidery in traditional Emirati bishts.